Cloaked in mystery, and located at an altitude of 3566m, this almost untouched land is situated in the westernmost part of the Himalayas. A challenge to the adventurers, Har-ki-Dun is supposed to have shared part of its history with the Pandavas. 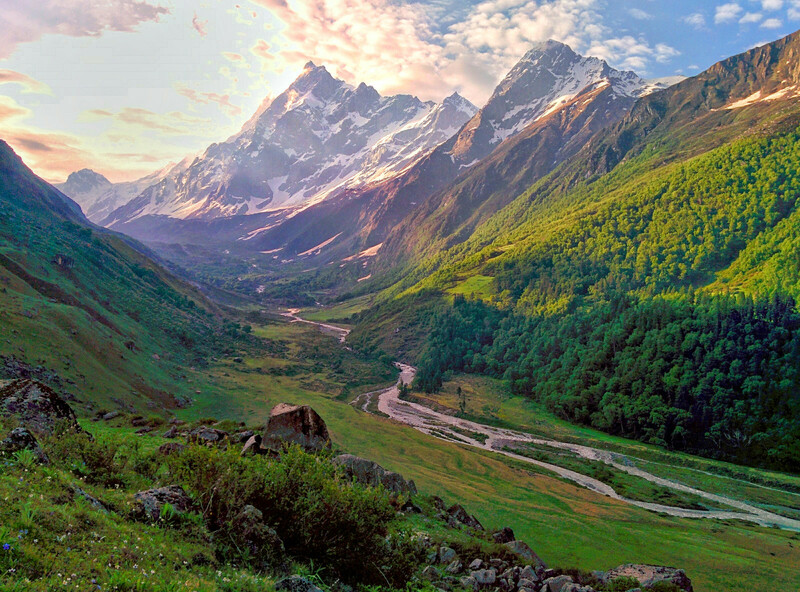 Har-ki-Dun (Har stands for Hari, or Lord Krishna, the blue-god, and Dun means valley), lies in the westernmost Himalayas of Garhwal, sharing its boundary with eastern Himachal Pradesh, and is dominated by the Swargarohini peak (6096m). Through the Yamuna and Tons valleys across the Yamuna bridge, Nainbagh, Nowgaon, Purola, Jarmola (Jarmola is one of the biggest and most beautiful pine forests in Asia), Mori and Netwar. Trek to a tiny market in Sankri, a few wooden huts serve simple yet delicious food. Dinner and overnight stay at the GMVN (Garhwal Mangal Vikas Nigam) Hotel Swargarohini . On an even surface through thick forests, with a few waterfalls on the way. Dinner and overnight stay at the GMVN rest house or the Forest Department's rest house or in tent at the camping. With packed lunch, to Seema (Osla 2559mt). 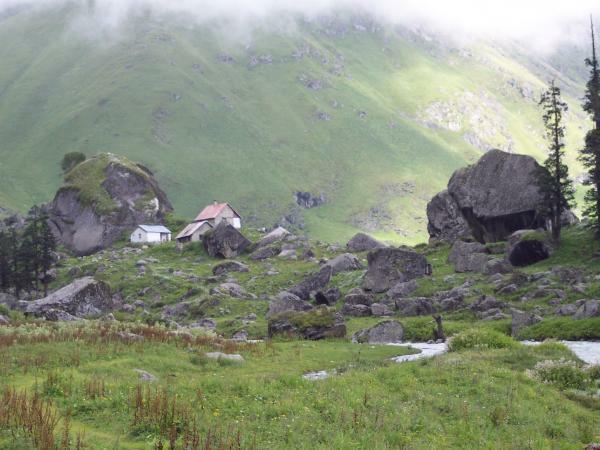 You could either opt for the steep climb of Dhaatmeer village, which is a path with beautiful views, or just trek along the Karmanasha stream. Both the routes meet at Gangaar village. Dinner and overnight stay at the GMVN rest house or in tent. On Har-Ki-Dun(3566mt) mountains, with packed lunch, to Har-ki-Dun on a gradual ascent that offers excellent views of the snow-covered mountains and vast valleys with huge waterfalls. The area is home to a number of rare species of Himalayan birds and flowers, and is full of birch and spruce. After the last steep climb of approximately 200m, you have the grassy field of Har-ki-Dun divided by the clear and calm Karmanasha stream. The beautiful Swargarohini stands tall overlooking this Valley of God. Dinner and overnight stay at the GMVN rest house or the Forest Department'srest house or in tent. .
Eads to the Jaundhar glacier (4000mt). 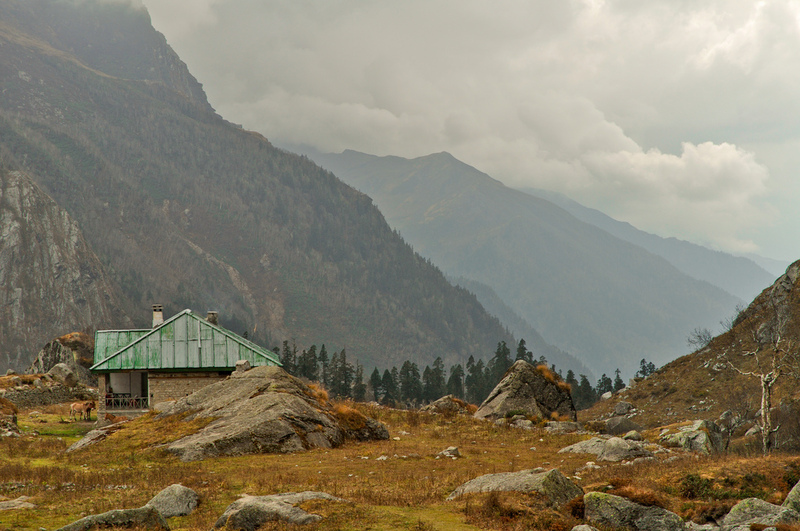 Trek back to Har-ki-Dun and further down to Seema, with packed lunch. Dinner and overnight stay at Seema]. (Cheludgad). with packed lunch. Dinner and overnight stay at Taluka. with packed lunch. Dinner and overnight stay at Sanakri. (Vehicle cost will be shared among all the participants at actual).